The Washington Capitals opened their 2017-2018 season this week, and it was something of an historic opening. From a pair of wins, to a goal explosion, to a debut from down under, it was a Week 1 to remember. The Caps opened their season with a pair of wins, the first time they accomplished that feat since the 2011-2012 season. That’s the good news. The bad news…the Caps won their first seven games that season and yet had a new coach by the end of November, when Bruce Boudreau was relieved in favor of Dale Hunter. Worse, the same thing happened in the 2007-2008 season, when the Caps won their first two games and, again, had a new coach by the end of November, when Boudreau relieved Glen Hanlon behind the Caps’ bench. Moral of the story… don’t get too high with the highs or too low with the lows. Alex Ovechkin is not going to score 287 goals this season. You can write that one down in pen. But with seven goals in two games, he became the first player in 100 years to record hat tricks in consecutive games to open an NHL season, the first since Cy Denneny, Reg Noble, and Joe Malone all did so to open the 1917-1918 season. However, as a technical matter, Ovechkin might be the first ever to record “hat tricks” in consecutive games to open a season, if you believe that the custom of tossing hats on the ice for a three-goal game originated in Guelph, Ontario. Almost forgotten in the Ovechkin avalanche of goals is the fact that Evgeny Kuznetsov recorded seven assists (Kuznetsov and Ovechkin ended the week tied for the league lead in total scoring with seven points apiece and tied for second in plus-minus with several other players plus-6 apiece), while rookie Jakub Vrana added three more, giving the top line quite a week. To that add that Nathan Walker, appearing in his first game, recorded his first NHL goal, and he hit history’s Daily Double – the first player from Australia to appear in an NHL game and becoming the first Australian to record a goal in an NHL game. Brett Connolly and T.J. Oshie added the other goals of the week, and 14 different skaters recorded a point for the team. The Caps held, if that is the right word, Ottawa and Montreal to 90 shot attempts for the week, which puts them in the middle of the pack, tied for 12-th most in the league with Winnipeg and the New York Islanders (numbers from NHL.com). Worse, that volume of shot attempts left he Caps with the tenth-worst shot attempt plus minus in the league (minus-11). If there was a bright spot, it was that the Caps were plus-9 when the score was tied, and the minus-21 when ahead is largely a score effect of having jumped out to such a big lead against the Montreal Canadiens early (4-0 after one period on Saturday night). It was hard to be Brett Connolly this week in the defensive end. Connolly was on ice for four of the five goals scored against the Caps. Brooks Orpik and John Carlson were on ice together for three goals against of their own. Braden Holtby got both starts for the Caps in Week 1, and his week was somewhat typical of a Holtby season start. He has never been particularly effective in his first game of the season (see our prognosto on the Montreal game for more on that). And against the Ottawa Senators, he was consistent with that profile, allowing four goals on 32 shots. He did not have as much help in front of him as he might be accustomed to, but it was not a classic Holtby performance, either. He did finish that game strong, and that effort spilled over into the performance against the Canadiens to end the week. He stopped 38 of 39 shots and resisted the temptation to lose focus as the Caps went out to a big lead early. There is not much to glean from the power play in Week 1. Yes, it did record a goal. Yes, it was an Alex Ovechkin goal. Some things are slow to change. The power play was also victimized by a shorthanded goal when the Caps forgot how to defend on a power play against the Canadiens, giving up the puck and letting Brendan Gallagher score from the top of the paint while a man down. Ovechkin had half of the shots on the man advantage for the week (four of eight), and the Caps recorded eight power play shots in 8:16 of power play ice time. 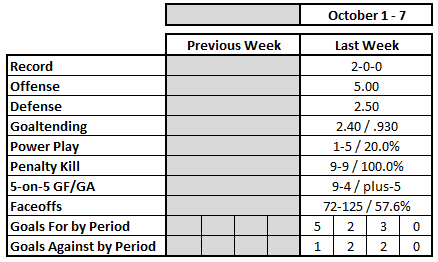 All in all, it was for the most part a rather typical week, the shortie notwithstanding. There was good and bad on the penalty kill this week for the Caps. Well, mostly good. The bad part was the volume. The nine shorthanded situations faced is in the middle of the pack in the league rankings (tied for 11th-most), but it was almost twice as many special teams opportunities for Ottawa and Montreal as the Caps had for the week (five). That led to those two opponents enjoying a better than 2-to-1 edge in power play ice time(17:27 to 8:16). The Caps might have been on the short side of opportunities and minutes on special teams, but they did not allow an inordinate number of shots relative to minutes (16 in 17:27). It is, and it was to be expected, to be a work in progress at the start of the season with new penalty killers in the rotation, but it was a good week, all things considered. If you are going to keep teams from scoring, it is best to have the puck. And what better way to do that than to take possession of it from the puck drop, especially in the defensive end? The Caps had a fine week overall in the circle, but they shined in the defensive end, winning 33 of 47 defensive zone draws (70.2 percent). Jay Beagle gave a master class in the subject, winning 15 of 17 defensive zone faceoffs (88.2 percent) as part of a 73.1 percent week overall. Evgeny Kuznetsov, who won just 44.0 percent of his draws last season, was a surprise, winning 14 of 24 draws overall (58.3 percent). Nicklas Backstrom was the only Capital to take ten or more draws and finish under 50 percent for the week (16-for-34/47.1 percent). That four-spot in the first period against Montreal in the second game of the week tilted the goal scoring toward the beginning of games, but don’t forget that three-goal third period against Ottawa in the opener. It reminded Caps fans that the team can still be explosive, scoring seven goals in a span of 33:55 across two games. 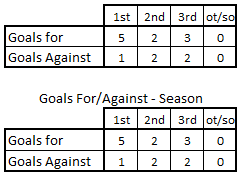 Of course, Alex Ovechkin had six of them in what was a remarkable week for him, even in the context of his career body of work (T.J. Oshie had the other one). At the other end, the Caps spread the gloom of opponents’ goals across the periods and did not allow either Ottawa or Montreal to score consecutive goals in any single period for the week, a way to stall momentum. Two games, two wins in the bank. If you are of the picky sort, you would say the Caps escaped with a win on Thursday and leaned too heavily on Alex Ovechkin on Saturday. If you are of a forgiving sort, you might respond, “so what?” Sometimes the captain takes over a game, and sometimes you rally from behind. In the context of a long season, neither game of the sort the Caps played this week is particularly informative. But you can’t take two wins off the ledger, and that is the takeaway from this week. Caps now have the leading goal scorers in Russian and Australian history.